Welcome to David Werden's Website! But this site is for much more than listing publications. I want it to serve as a great educational resource for players of all levels. On this site, you'll find: auditions, a section with helpful advice and examples on taking military band auditions, videos, a collection of carefully selected/screened brass videos, a forum for discussions about euphonium, tuba, and general music, blog, my own blog featuring articles about euphonium and general music, articles by me and guests about music and low brass, a collection of articles by the great Arthur Lehman, a collection of articles from the classic "Euphonia" magazine, an interactive guide to mouthpieces for trombone, euphonium, and tuba, a useful and interactive intonation guide for compensating euphoniums, three forms of advice on buying euphoniums at various price levels, a little humor for lifting your mood, and much more. Use the menu at the top to browse all the areas you'll find here! If you find any problems on the site, please report them to the webmaster by using the contact form. OOPS. We Don't Have a Poll Just Now. We'll try to come up with some goood questions soon! Brass Quintet CD: Center City Brass - On the Town, music by Bernstein, Gershwin, Strayhorn, and more. Brass Quintet CD: Empire Brass - Music for Organ, Brass & Percussion - grand music! Jazz Tuba CD: - Bob Stewart, Then and Now - Great charts featuring tuba in a jazz setting. This site is intended to be a valuable resource for tuba and euphonium / baritone. You will find special articles for baritone / euphonium and tuba on this site that are not available anywhere else. 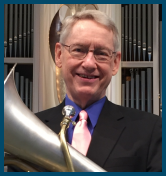 We also host other sites of interest to low brass players, including the official website for America's Premier Large Tuba-Euphonium Ensemble, Symphonia (founded by R. Winston Morris) , and a site with helpful advice and examples on taking military band auditions. If you find any problems on the site, please report them to the webmaster by using the contact form.